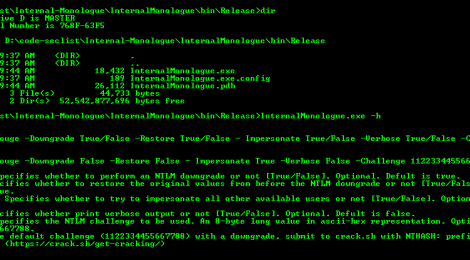 Browse: Home / Internal Monologue Attack: Retrieving NTLM Hash without Mimikatz. Mimikatz, developed by Benjamin Delpy (@gentilkiwi), is a well-regarded post-exploitation tool, which allows adversaries to extract plain text passwords, NTLM hashes and Kerberos tickets from memory, as well as perform attacks such as pass-the-hash, pass-the-ticket or build a golden ticket. Arguably, the primary use of Mimikatz is retrieving user credentials from LSASS process memory for use in post exploitation lateral movement. Recently, Microsoft has introduced Credentials Guard in Windows 10 Enterprise and Windows Server 2016, which uses virtualization-based security to isolate secrets, and it is very effective in preventing Mimikatz from retrieving hashes directly from memory. Also, Mimikatz has become a prime target of most endpoint protection solutions, from Windows Defender to FireEye HX, and they are very aggressive in their efforts to detect and prevent it. Although these efforts are bound to fail, they are increasingly becoming a nuisance. In secure environments, where Mimikatz should not be executed due to controls such as Credential Guard, an adversary can perform an Internal Monologue Attack, in which they invoke a local procedure call to the NTLM authentication package (MSV1_0) from a user-mode application through SSPI to calculate a NetNTLM response in the context of the logged on user, after performing an extended NetNTLM downgrade. + Disable NetNTLMv1 preventive controls by changing LMCompatibilityLevel, NTLMMinClientSec and RestrictSendingNTLMTraffic to appropriate values, as described above. + Retrieve all non-network logon tokens from currently running processes and impersonate the associated users. + For each impersonated user, interact with NTLM SSP locally to elicit a NetNTLMv1 response to the chosen challenge in the security context of the impersonated user. + Restore the original values of LMCompatibilityLevel, NTLMMinClientSec and RestrictSendingNTLMTraffic. + Crack the NTLM hash of the captured responses using rainbow tables. The Internal Monologue Attack is arguably stealthier than running Mimikatz because there is no need to inject code or dump memory to/from a protected process. Because the NetNTLMv1 response is elicited by interacting with NTLM SSP locally, no network traffic is generated, and the chosen challenge is not easily visible. No successful NTLM authentication event is recorded in the logs. This tool is a proof of concept that implements the Internal Monologue Attack in C#. Porting the code to PowerShell may substitute certain event logs in the audit trail with others. The PoC code is far from perfect. ← s3scanner – Find S3 buckets and dump.